I fell in Love with Laura Sparling's beautiful Easter focals when I saw them and decided I must have one or my life would be incomplete (This is how beads get you sometimes!). Last week, was a strange one, what with loosing Sasha and various other life changing events that I will go into in a moment, I just had to calm down and relax with some jewellery making. This pendant must have taken me about three hours to make and my hands were so sore!!! 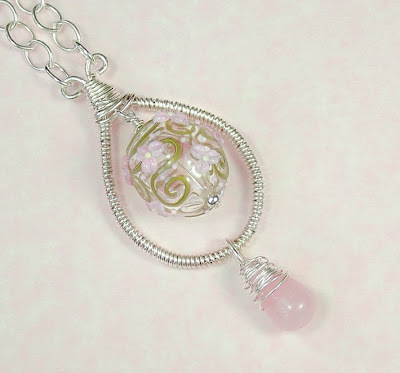 I teamed the bead with sterling silver and a gorgeous Rose quartz drop. I love it and it's mine! I wore it all last week and lots of people commented with 'oooohs' and 'ahhhhhs'. Lovely!! Mark had some brilliant news last week. He has just been offered a job for the massive web design company based in Manchester called Lightmaker. I am so happy for him as he is so passionate about his design work! After much thought we have both decided to move there. Manchester is about 90 miles away from us, so it's pretty far! I had to inform my boss on Friday which I was so scared about, but she was lovely and very supportive. Mark and I went to Manchester on Saturday and found a lovely apartment which we secured, so now we're trying to sort that out too. It's all go!!! But we both fell in love with it, can't wait! Part of me is very very scared to leave everyone and everything behind, I am an only child so I'll miss my parents so much but they have agreed to visit as much as possible and of course there is no excuse not to keep in touch these days what with email and texting and goodness knows what else! The necklace is beautiful Janine. You've done a fab job - hope your fingers are better today! Big congratulations to Mark! Wonderful news about his job and the company looks great. And big congratulations re your move! I can imagine that it's really exciting/scary/a bit overwhelming but I'm sure it'll all be fine. Manchester's a fab place. Wow! I'm really happy for you both and I wish you lots of luck and every success. Exciting times! 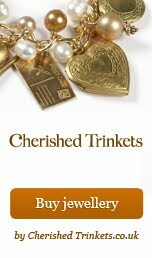 Just read the My Vintage Charms write-up. Fantastic! Thank you Laura, yes its all scary and exciting at the same time!!! All sounds like fantastic news, congrats on job and move, 90 miles is nothing really, we moved 95 miles away from town we were both born in but best thing we've ever done, if we had stayed in Ascot I wouldn't be working with beads and if I wasn't doing what I do, then I wouldn't have met you lot! Keep at the wirework, you're fab at it! Exactly Mandie! If I don't go I'll always wonder what if!